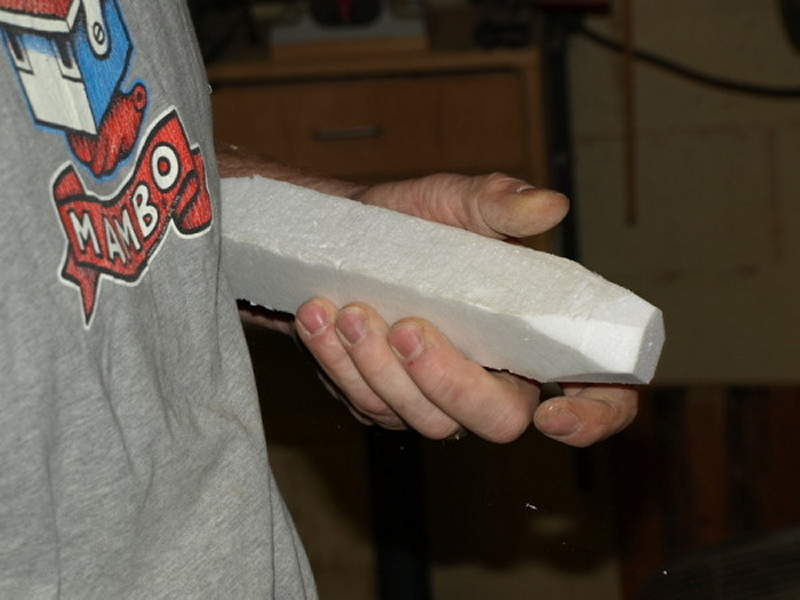 Raffle We will be raffling off a fine ¾” Glaser skew chisel donated by Paulo Marin at our June 20th meeting. 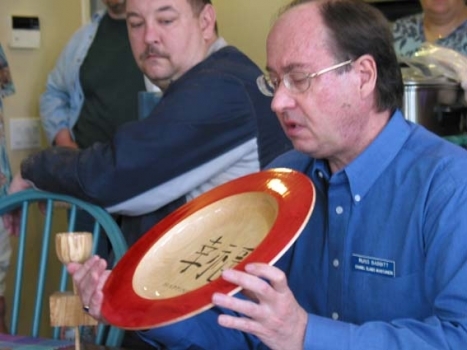 If you can contribute some wood blanks or a roughed-out seasoned bowl blank as an enhancement to the raffle, bring it to the meeting. It’s always fun to go home with project wood. Club Library A fine addition to the club library has been made. Eli Avisera’s 5-DVD beginners set and 7-DVD intermediate set have been purchased. The DVDs from the set can be checked out individually and must be returned by the next meeting. The Club is asking for compensation for any unreturned DVDs by the borrower. Avocado Bowls We are continuing to collect avocado bowls. 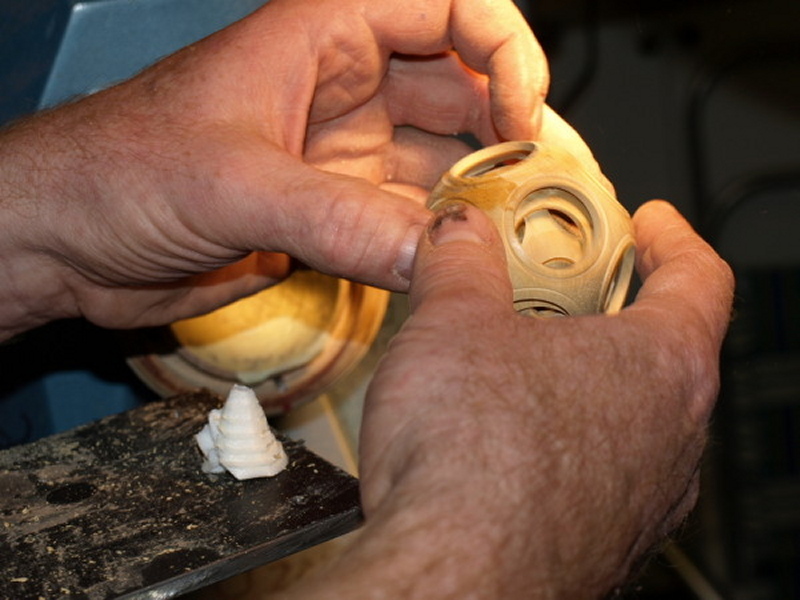 If you have any bowls finished for Tim Albers be sure to bring them to the meeting at Levi’s shop. Show & Tell We will be having Show & Tell, so bring you latest project to share with your fellow turners. 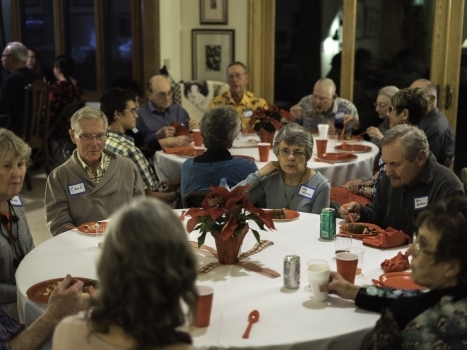 Summer Social Mark your calendars for the annual Summer Social at the Rinde’s on July 18th. Eyeglasses & Hearing Aids John Knittle is collecting used eyeglasses and hearing aids for the Lion’s Club. If you have any to donate, John will collect them at the meetings. 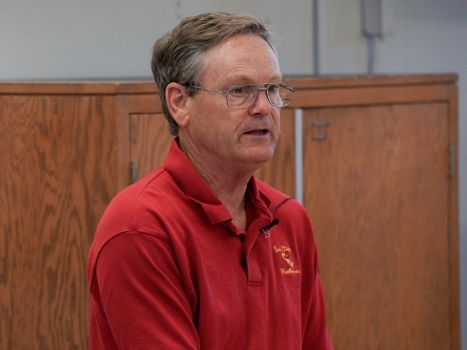 New and continuing members should pay their 2009 club dues of $25 to treasurer Ron Lindsay. Please mail them to him or bring to the meeting. The membership forms in Word and Acrobat formats can be accessed from the top of the Bylaws page. AAW Symposium – June 26-28 in Albuquerque, NM. Al Geller, Dave Hutter, and Pete Ortega are coordinating scheduling for our booth at the fair. 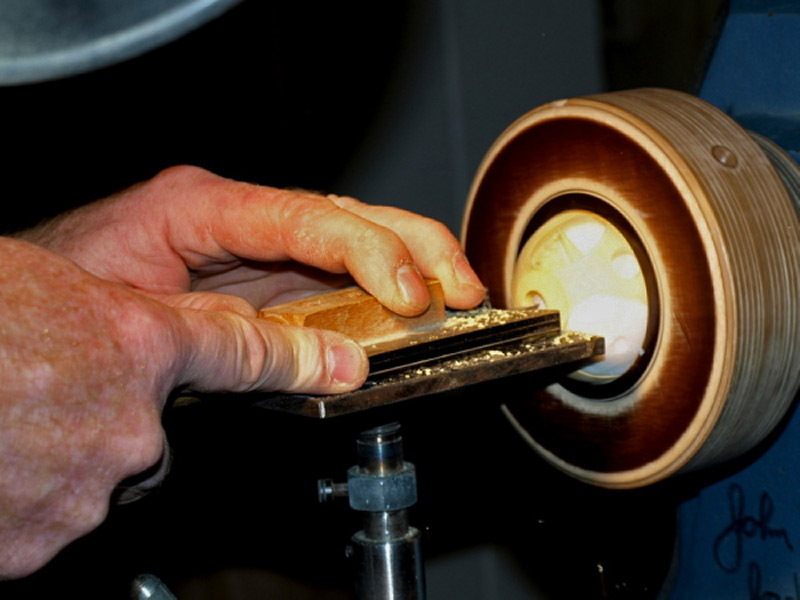 Please be prepared to sign up for particular time slots – to demonstrate woodturning on the club mini lathe – starting with the 20 June meeting. 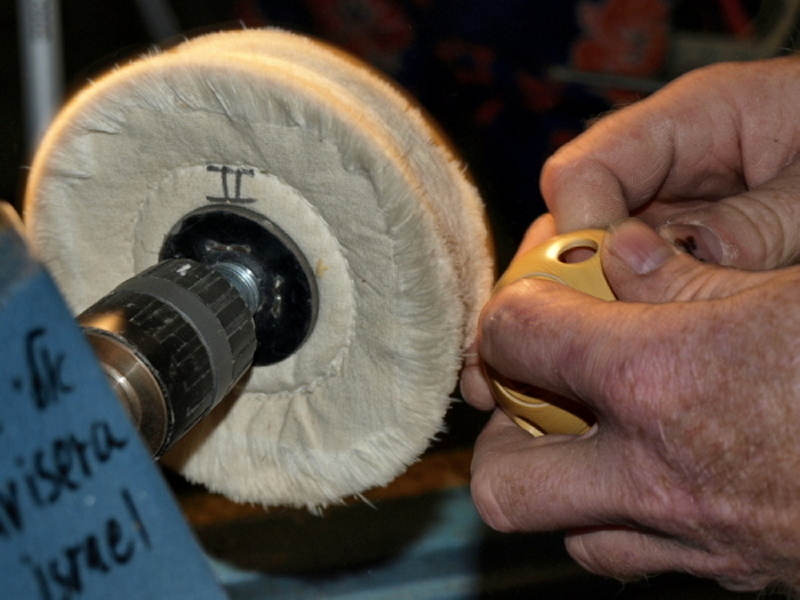 There are now twelve Classes for judged entries in Division 345 Woodturning. They added Class 5, Fair Theme, which this year is “Purebred and Home Grown.” Get your entries prepared if you haven’t already. Entries must be submitted July 24-26 10 am to 5 pm. We usually have a display cabinet near our booth at the fair to show our work separate from the judged entries. Be prepared to contribute to this as well. Christian Delhon provided an interesting day-long demo on May 23, 2009. Christian is from Berck, France. Berck is 229 km north of Paris on the French coast, about a 2½ hour drive. 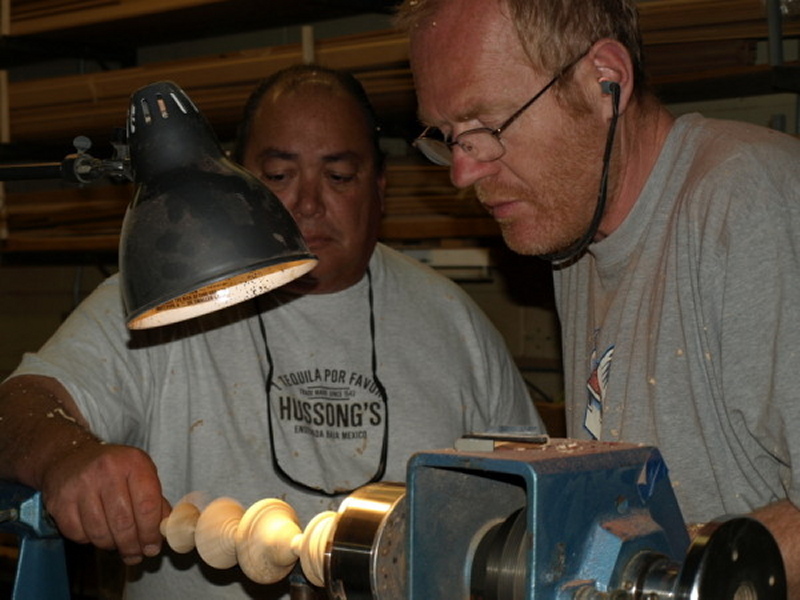 Christian was born in 1960 and became interested in woodworking at age 15. 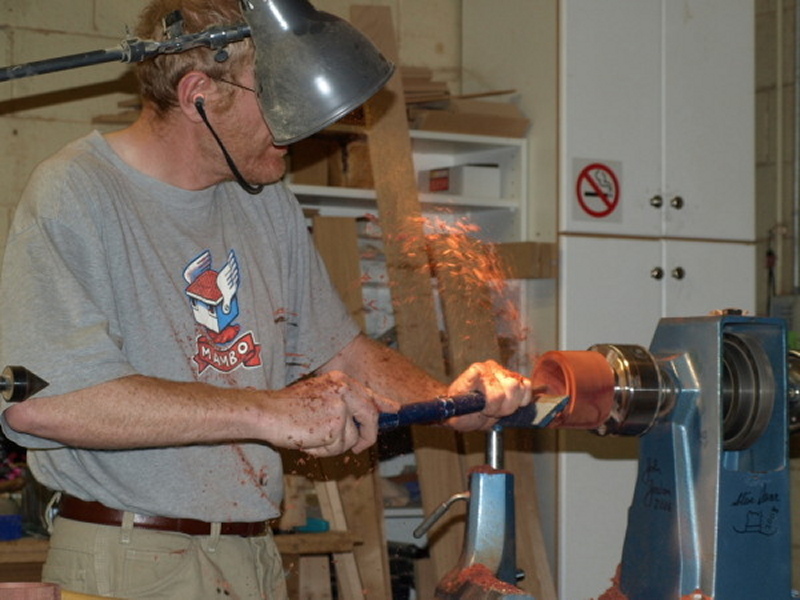 He began studying to become a cabinet maker. In 1977, he was accepted by the Ecole Boulle. Founded in Parisat the end of the 19th century, Ecole Boulle is one of the leading trade schools in Europe. After two years he received a degree and continued to work in Paris for the next four years. In 1984 he returned to Berck as an artisan cabinetmaker. 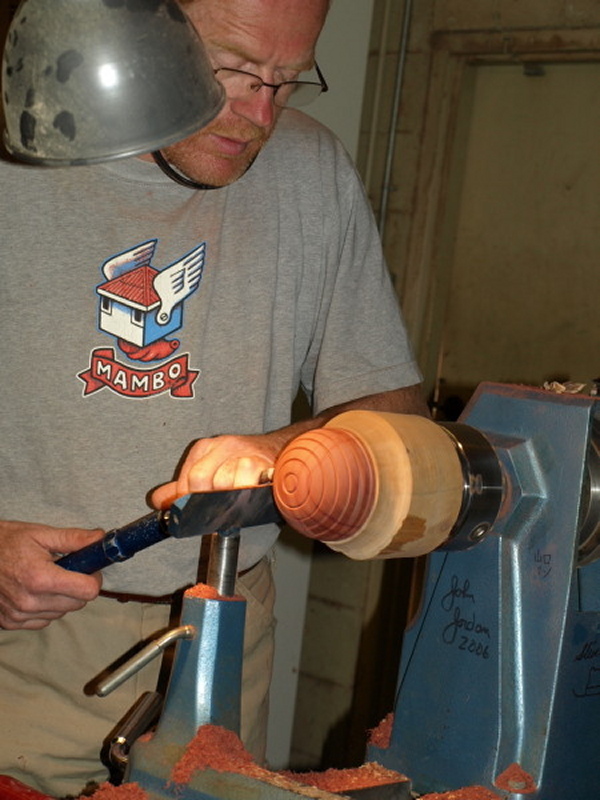 Having always been attracted by woodturning, he learned the rudiments of the profession in 1994. He has been trained by Jean Francois Escoulen of France and has participated in professional internships with renowned turners such as Terry Martin, Michael Hosaluk, Mark Sfirri, André Martel and others. 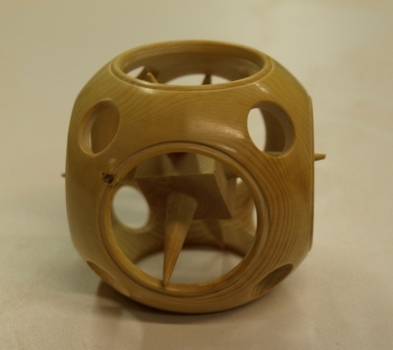 Christian began his demo with a six-pointed, spiked, captured cube inside of a sphere (spiked ball) and multiple captured spheres commonly referred to as Chinese balls. Both objects were made using his specially designed tools and tool holder, which Paulo Marin indicated he will make commercially for Christian. 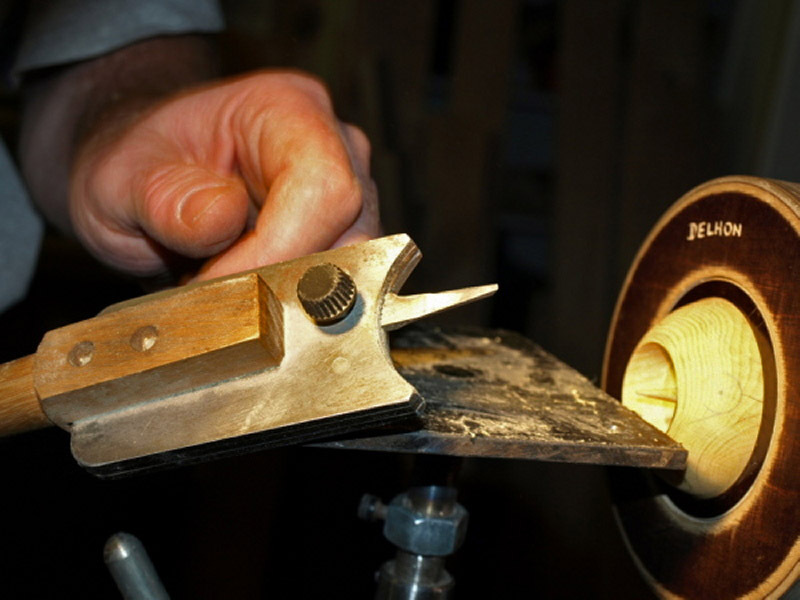 The tool holder is shown in the photos, having a pointed tool for making the spiked ball — also shown in the pictures. 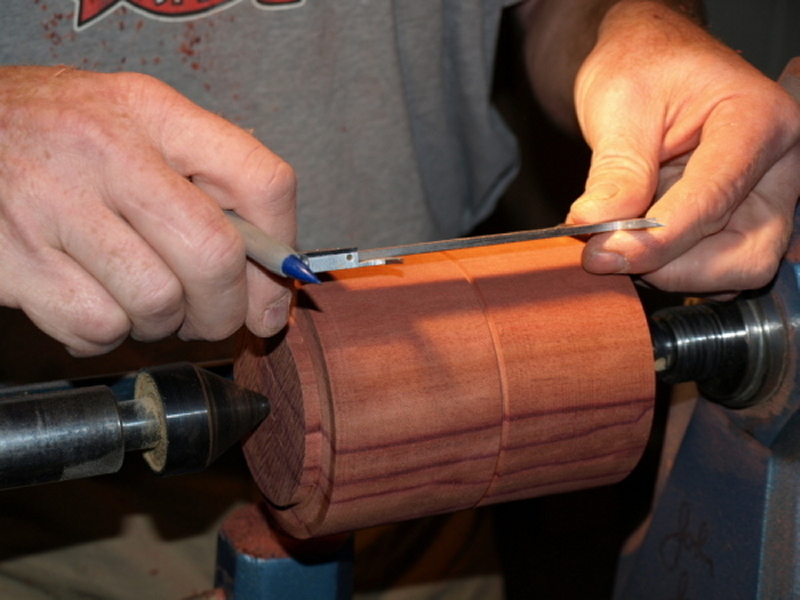 These projects require using dry dense hardwood, a special sphere-holding chuck and a tool holder with special pointed and offset radius cutters. 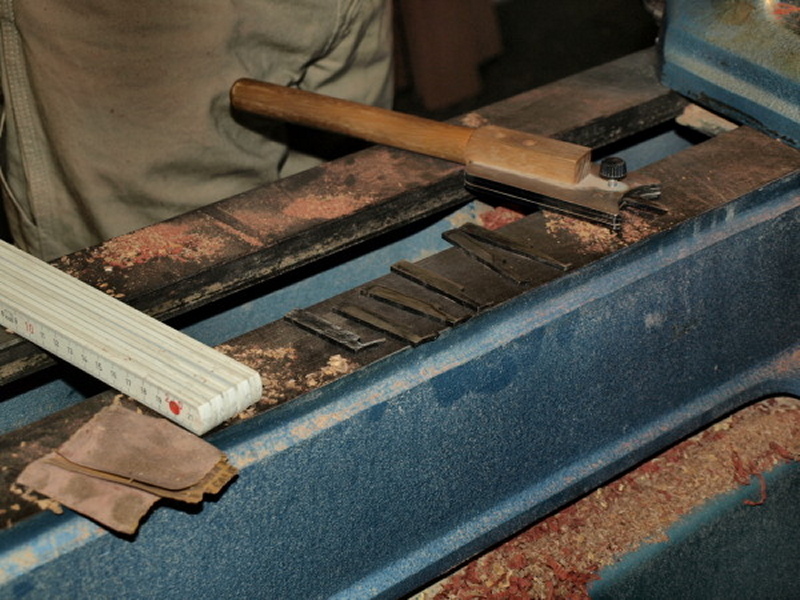 A flat plate tool rest supports the tool holder. 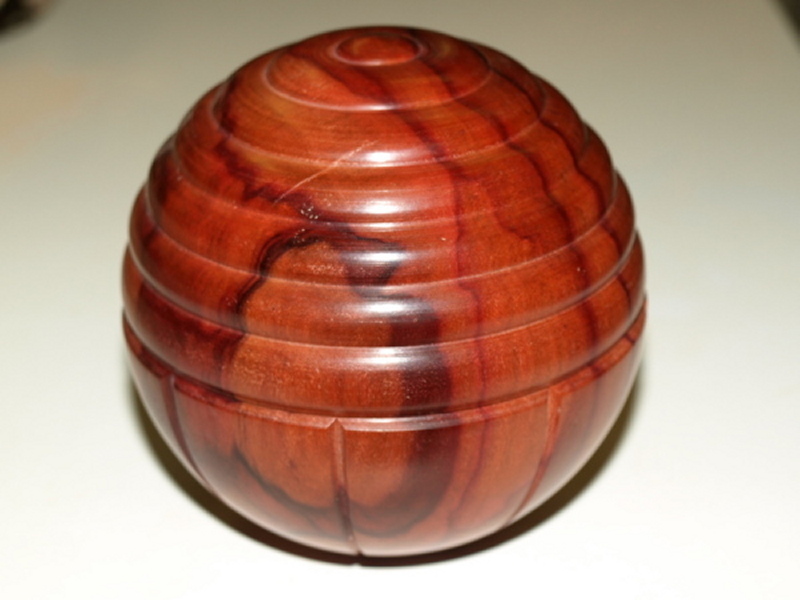 These projects are also discussed in great detail in David Springett’s book “Woodturning Wizardry,” available at Amazon.com, your local book store or woodturning catalog store. (Also check the club library for books and videos.) Springett’s tool holder and tools are available in the U.S. from Craft Supply USA and Packard Woodworks. They are slightly different from Delhon’s tools. Accurate layout and patience are required. 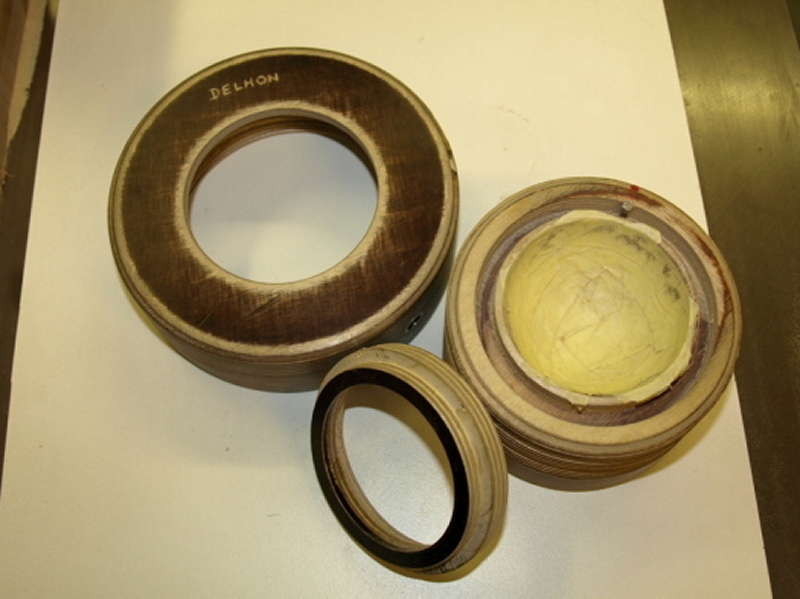 Christian did not rely upon the tailstock to center the spherical openings. 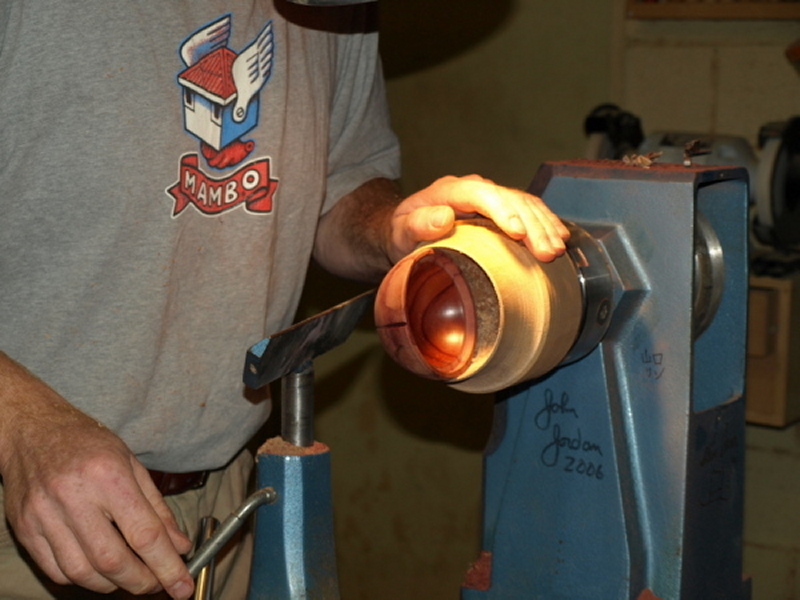 He adjusted the sphere up to six times to get the center of the opening exactly at the lathe center. Once the sphere is firmly held in the sphere chuck, cutting the spikes or the Chinese balls appeared to be relatively simple. Always cut the end grain spikes in the spiked ball and the end grain openings in the Chinese ball first, since end grain is the hardest wood. This will also help eliminate chipping the edges of the captured cube in the spiked ball. 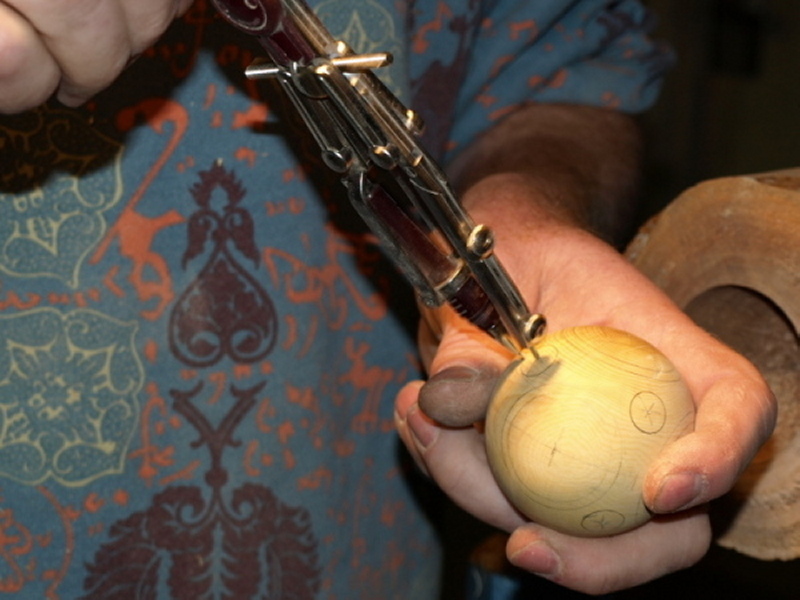 Delhon’s handout from the demo gives a step by step detailed procedure for making the Chinese balls. See also the accompanying photos. Springett’s book is another good resource. 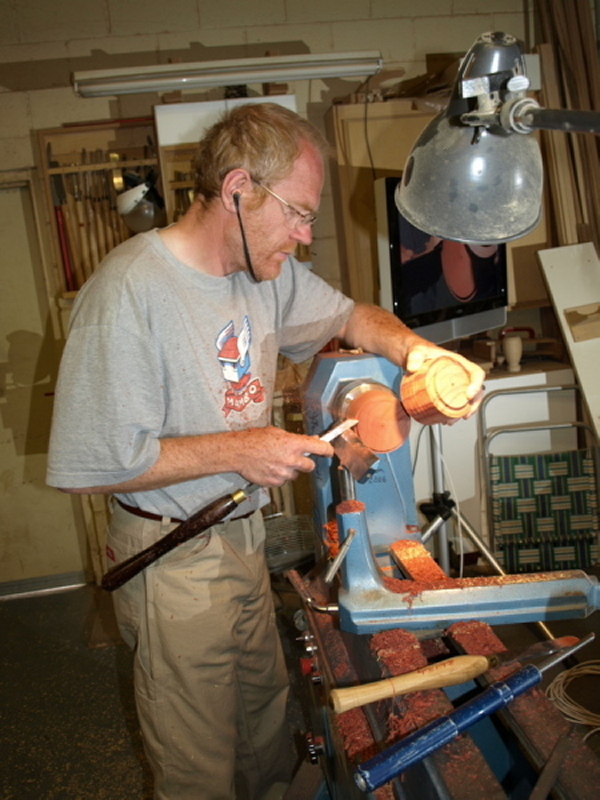 Finally, Christian turned a Trembleur, a long spindle with beads separated by thin sections. 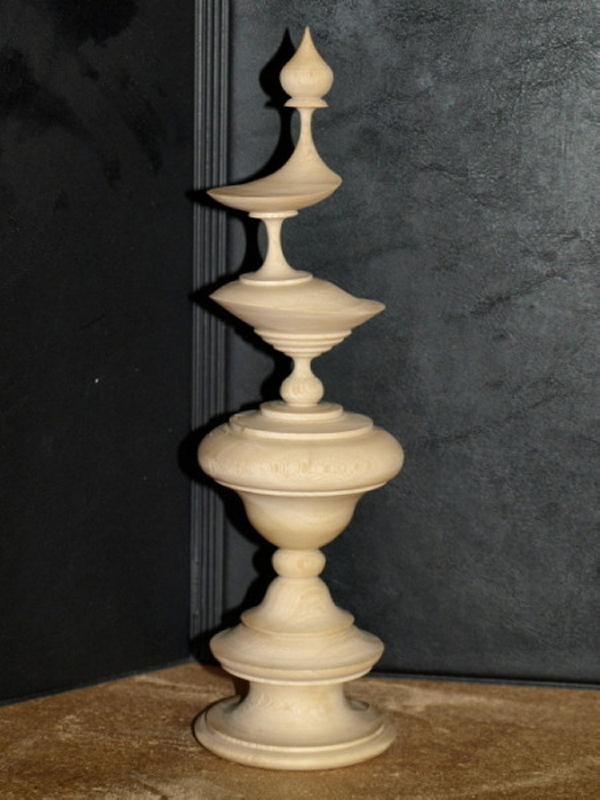 French woodturner Jean Francois Escoulen resurrected these forms by studying old books about turning. 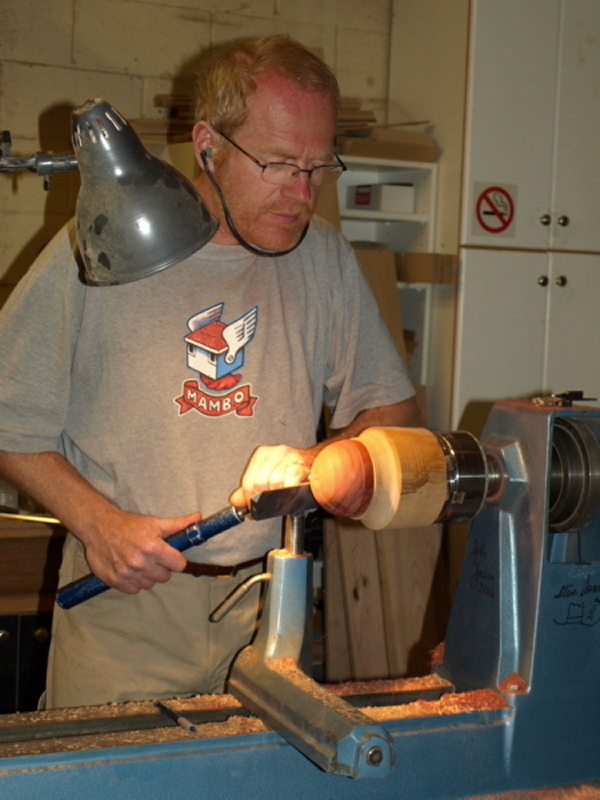 There is a good article on Trembleurs in the Winter 2002 edition of American Woodturner on page 17. Much of Christian’s work was done with a bedan. 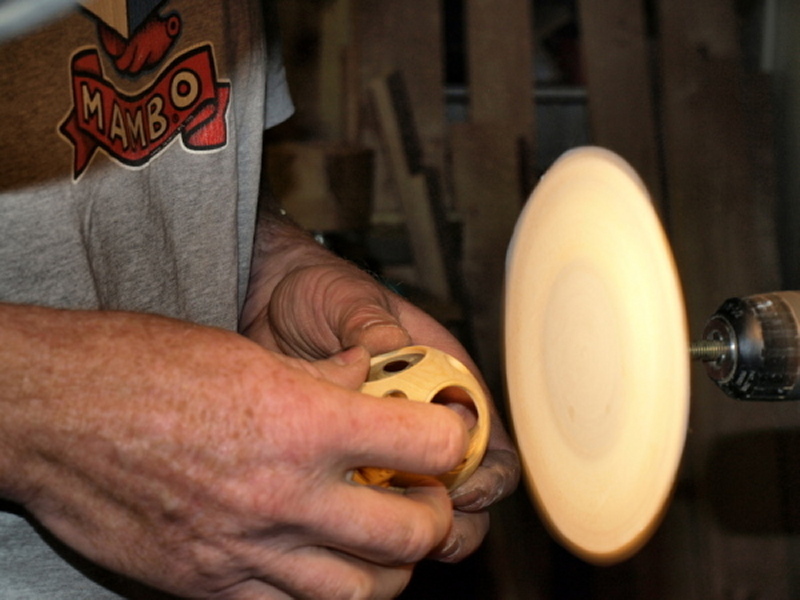 French woodturners use the bedan extensively. 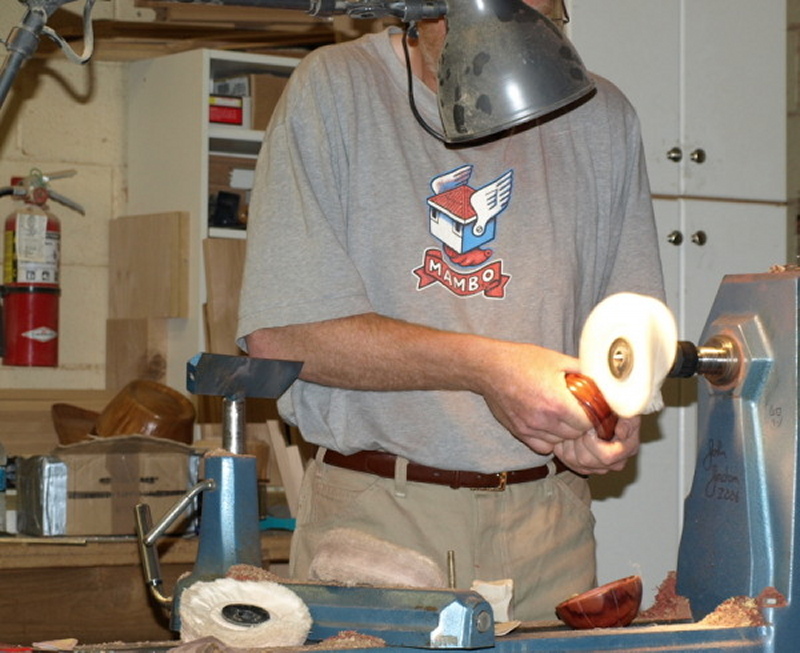 There is an excellent article on the bedan in the Winter 2002 edition of American Woodturner, page 20. 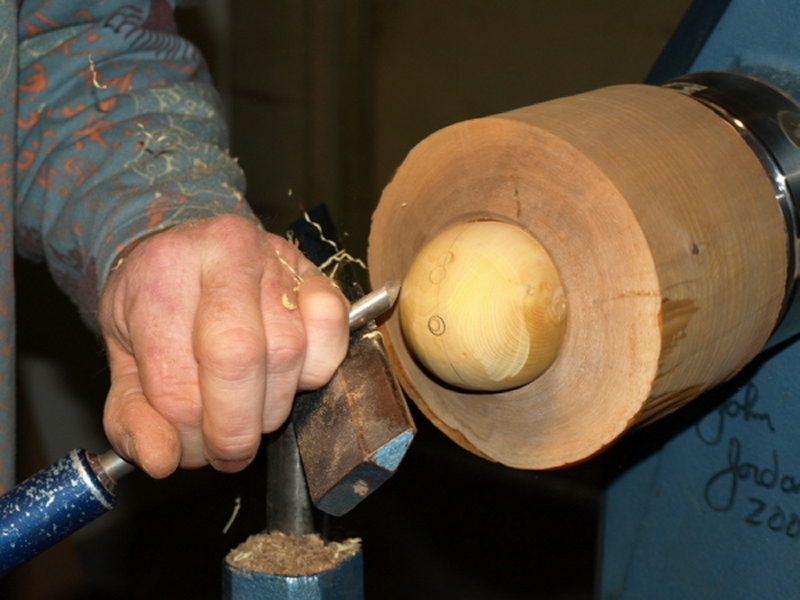 There is more information on line on Trembleurs and how to make one. 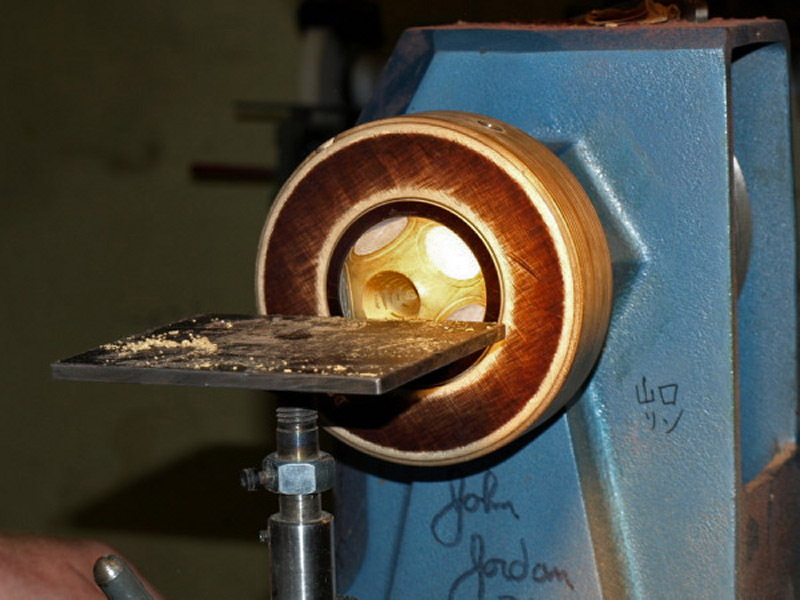 See Woodturning Online: www.woodturningonline.com and go to the project page index. Then click on Trembleur. 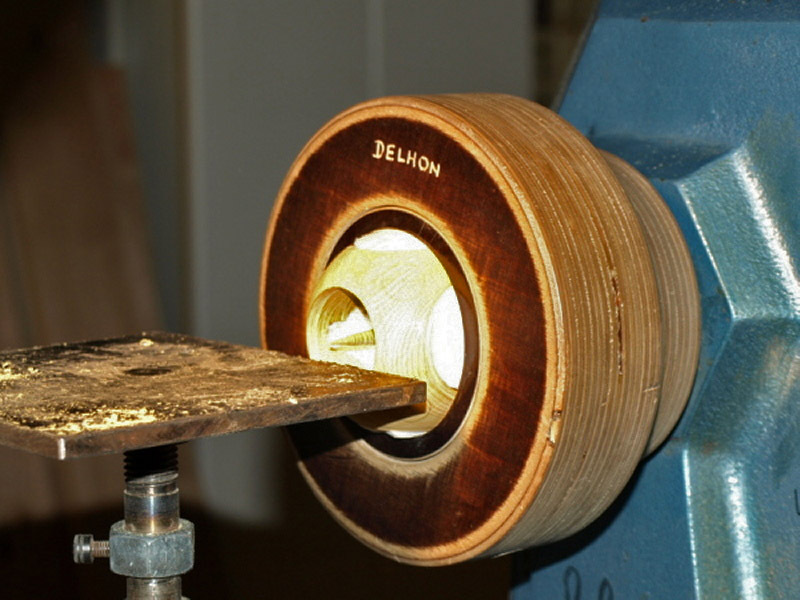 Final thoughts: Christian Delhon is an excellent woodturner who has mastered the art of tool control. 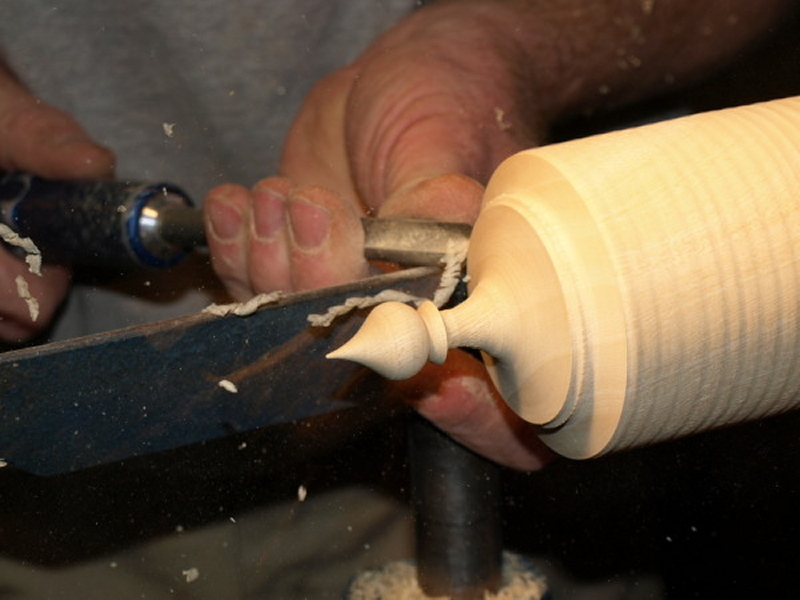 Anyone will improve their turning by attempting and practicing the skills he used to create these beautiful and challenging projects. 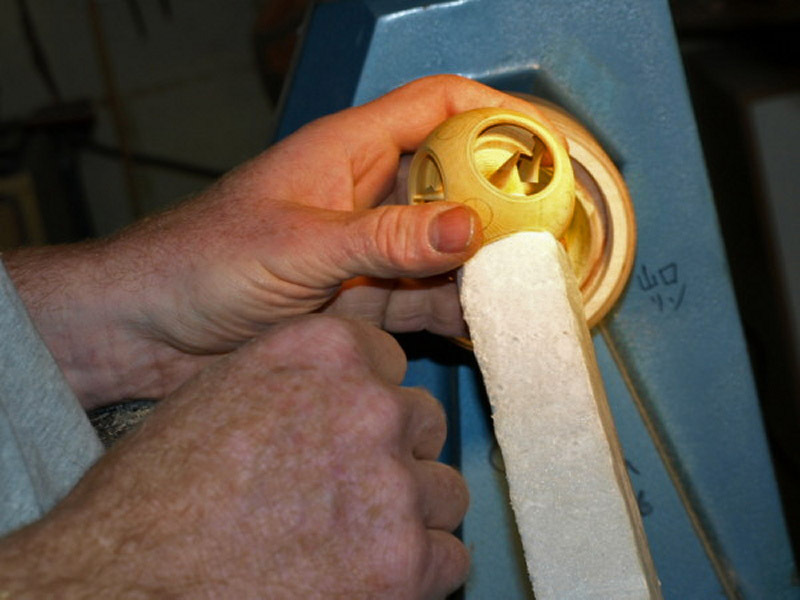 Chinese ball mounted in the sphere chuck. Previously cut holes have been stuffed with polystyrene. 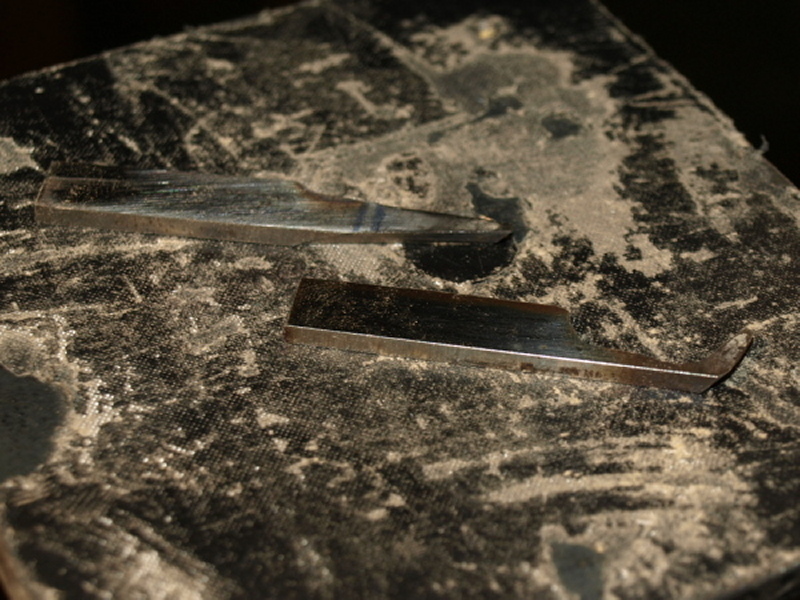 Close-up of custom cutting blades made from planer blades. Cutting the last spike. All other holes have been stuffed with polystyrene.